“Guns in the Hands of Artists” runs from June 1 through Oct. 13 at Fairfield University's Quick Center for the Arts. FAIRFIELD — From his first gallery near the notorious St. Thomas Housing Projects in New Orleans, Jonathan Ferrara often heard gunshots. The 1940s projects were known as some of the most violent in the country in the 1980s and 1990s, in a city that has often been among the most violent per capita. The shots and the surroundings helped to shape his views on guns. 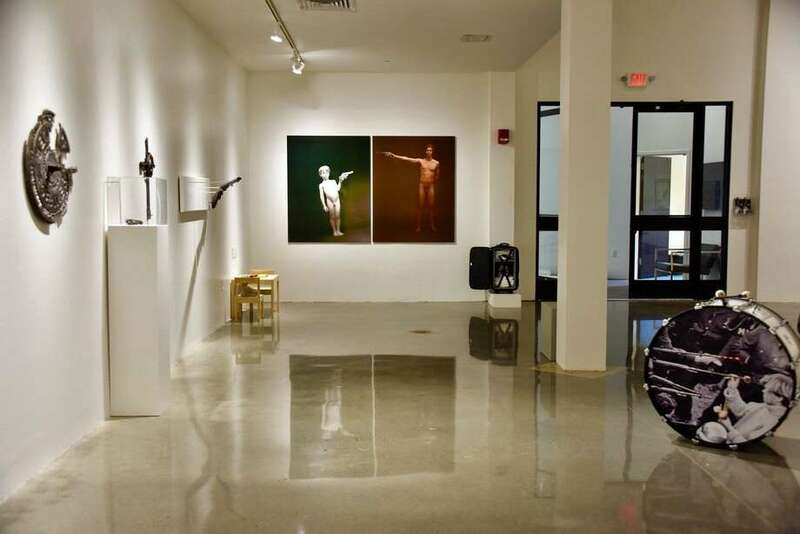 Ferrara is one of two co-producers of “Guns in the Hands of Artists,” a groundbreaking installation that debuted at his gallery in 1996, had a second run in seven American cities in 2014, and now, from June 1 through Oct. 13, will be on display the Quick Center’s Walsh Gallery at Fairfield University. The exhibition includes works by artists from cities throughout the country, including New Orleans, New York, Minneapolis and Portland, using decommissioned guns obtained through a buyback program that Ferrara helped to fund. “The premise was to take guns off the streets, working with the police department and the mayor’s office, and basically to use the thing, to talk about the thing,” Ferrara said. The exhibit opening will take place at 5 p.m. on Thursday May 31, beginning with a panel discussion on “Art Making for Social Change” with exhibit curator Jonathan Ferrara and other exhibiting artists, moderated by Helen Klisser During. The works include painting, photos, video, mixed media, sculpture, and glass work, and are accompanied by artist statements explaining the creator’s point of view, which Ferrara hopes will help to start a non-partisan conversation. Forty percent of the artists participating, Ferrara said, are gun owners. Another forty percent are victims of gun violence. “I never curated it with that intention, but there are a multiplicity of different artists in the show and as many different interpretations. There is no duplication of message,” Ferrara said. Ferrara’s own contribution, “Excalibur No More,” a shotgun barrel stuck facedown into a rock, is a play on the Sword in the Stone, and is one of the first pieces one sees entering the gallery. Another, by Adam Mysock, called “The Last Six, Under Six, Murdered by a Gun in the Sixth,” features six miniature portraits of children, all under age 6, killed by guns in New Orleans’ Central City neighborhood — the city’s sixth police district — displayed within small bullet holes carved into the gallery’s walls. The exhibition was brought to Connecticut with the help of two women, Mary Himes and Helen Klisser During, who co-founded the Unload Foundation, which uses art as a catalyst for conversations between gun owners and gun safety advocates. “We are not putting forward policy ideas. Our project is about offering opportunities for people to listen to one another and share ideas with one another,” said Himes, whose husband is U.S. Rep. Jim Himes, D-4. “I think everybody’s frustrated, it doesn’t matter if you’re a Democrat or a Republican, a gun owner or not. This is a deep, deep concern and frustration,” said During. In addition to the exhibition, Himes and During hope to bring a dance performance to the space. They are partnering with the Bridgeport nonprofit Neighborhood Studios of Fairfield for a two-week art workshop with a group of 13 through 18-year-olds. They hope to host a series of panel discussions, both at Fairfield University and Grace Farms, in New Canaan and helped last fall to raise money for a gun buyback in Hartford. As was the case in New Orleans, the decommissioned Hartford guns will be given to local artists to create art that will then be displayed at Artspace in New Haven later this year. Himes and During hope to invite a diverse group of people into the conversation and address multiple facets of the debate surrounding gun violence and legislation, the focus of which Ferrara said has shifted since the exhibition’s inception. “When the exhibition was first done in 1996, we were addressing the issue of urban violence. It was basically before school shootings and before mass shootings. But in the aftermath of Sandy Hook, another layer was added to it. Urban violence doesn’t stop. And now there’s a lot of focus on mass shootings. They’re all significant,” Ferrara said. Ferrara staged the second iteration of the exhibition in 2014, after mass shootings, like Sandy Hook, made him question if there was more he could be doing. He helped police and the city to buy back more guns and the show traveled from New Orleans to Aspen, Art Basel in Miami, Minneapolis, Washington University in St. Louis, and Washington, D.C., on a sponsorship from Sen. Tim Kaine, D-Va.
“You can have this exhibition hosted in 50 different states and different issues will be brought up and different conversations will be had,” Ferrara said. In addition to school shootings, mass shootings, and urban homicides, Ferrara said he hopes suicide deaths, which outnumber all other gun deaths, will also be part of the conversation. With all of those many factors in mind, the group hopes the exhibit can bring people across parties, across cultures, and across regions of the country agree on one simple fact. “I think, fundamentally, no sane person wants to see this carnage,” During said.